Below are the latest Tracfone cell phones at the best prices we've found, plus great deals on other Tracfone devices and airtime. Finding the best deal on Tracfone devices and minutes is not always easy with the wide number of locations they are available. But we are often checking prices, and learning about discounts, and so we are here to help share the best deals on newer Tracfone smartphones, as well as some great deals on other devices or minutes. The Galaxy Sky comes with 16 GB internal memory, a quad core processor and 1.5 GB RAM as well as Android 6.0. It has some of the best specs for a budget smartphone from Tracfone, and is available at a good price with airtime bundles. Visit our review of the Samsung Galaxy Sky to learn more. The iPhone 5S is still a popular smartphone choice and Tracfone recently began offering them directly. The iPhone 5S has a 4" touchscreen and runs on Apple's iOS. Visit our post about the iPhone 5S to learn more, and see where else it might be found. This deal is directly from Tracfone, so visit their site, and go to 'Shop Phones' and the reconditioned iPhone 5S should be listed in the list. If you don't see it, the phone may be sold out or unavailable in your area. Those are some of the newer phones from Tracfone at the best prices we've found, now we have several great deals on slightly older devices. Although it is more than a year old, the LG Sunset still has some great features including a 4.5" touchscreen, Android 5.0.1, 8 GB internal memory and a quad core processor with 1 GB RAM. Visit our full review of the LG Sunset to learn more. The deal below includes the phone and an airtime bundle worth $100 for just $69. The LG Rebel was a popular budget phone when it was released, and comes with Android 5.1.1, a 4.5" touchscreen, 8 GB internal memory and a quad core processor with 1 GB RAM. You can see more features, and learn about some users' reliability issues with the phone, in our LG Rebel Review. With the deal below you get the Rebel with a $30 airtime card, meaning the phone costs just $20 which is a good deal. The LG Lucky is a fairly basic Android smartphone but it can run a handful of apps and do all the normal cell phone tasks like texting, surfing the web and more. It comes with a 3,8" touchscreen, 4 GB internal memory and Android 4.4. See full specs and more in our Review of the LG Lucky. The deal below comes with the LG Lucky plus a 200 Minute Airtime Card worth $40 for just $29 total! 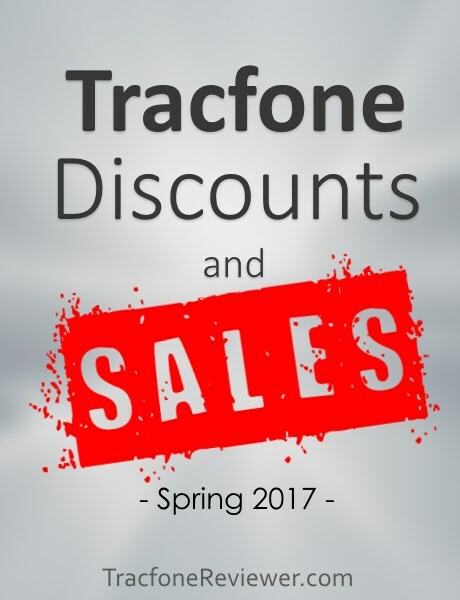 That concludes our list of Tracfone deals, discounts and sales! We appreciate your comments, and let us know if we missed any great deals! If you enjoy getting the best deal, take a look at our Airtime Comparison Table as well as our Auto-Refill Comparison and learn which Airtime card and Auto-refill option is the best deal! Keep up with the latest news and reviews by following us on Facebook. We also have a Youtube channel! If you're new to Tracfone, start with our Beginners Guide to Tracfone which will help share some of the basics. Here are the top 7 phones made by LG for Tracfone prepaid cell phone service. Tracfone is a prepaid wireless service provider that offers low cost cell phone plans, and also devices to use on those plans. Each of the phones below offers certain features and benefits the others may not be able to offer, so it is important to analyze which phone may be right for you. Some of the phones are older, non-smartphones, but most are Android devices. These are a wide variety of LG brand phones available with Tracfone, for those who like the LG brand and want to narrow their search to one brand. If you prefer other brands of cell phone, you may find our Cell Phone Reviews page useful. LG products are great, and the same is true for their mobile devices from Tracfone, so let's get straight to the top 7 LG phones from Tracfone. It comes with mobile web, courtesy of 3G connectivity speeds. It also has a 1.3 MP camera, hands free speaker, voice dialing and all the other features normally included with a Tracfone. The only downside to this impressive little phone is that it only comes with Double Minutes for Life. There are two slightly newer versions, the LG 441G which is almost the same, and the LG 238C which is for use with CDMA (Verizon) service. Overall, this LG phone is small, convenient and has great value as a backup phone, or for other uses. You can read TracfoneReivewer's full LG 440G Review to learn more, including how to find it for less than retail price. If you're looking for a basic phone, the LG 440G might be it. Our #7 pick for best LG Tracfone is the 840G. It has semi-modern features, and provides great value and functionality to consumers. It comes with Triple Minutes for Life, which means that every minute you add is tripled! But the LG 840G does not use Android OS, meaning you can't access most popular apps. The phone does have WiFi, and it is possible to install java based apps. The touchscreen on the LG 840G is better than the touchscreen on the older, LG 800G. It may take some getting used to, but functions well and helps make this phone look like it is part of the modern smartphones, even if it isn't quite there yet. Overall, the LG 840G is more stylish than older phones, but lacks when compared to the smartphones available. You can read our entire Review of the LG 840G to see all the features, and where to find it for less than retail price. These phones come with Android 4.4, a 3.8" touchscreen for those who want a smaller sized device, and also an improved amount of processing power and RAM compared to older smartphones. Read our Review of the LG Lucky for more details on this phone, and where you can find it. While the Sunrise and Lucky are adequate smartphone devices, we suggest a newer smartphone if you plan to run more than one or two apps. The LG Ultimate 2 was like a breath of fresh air when it was released on Tracfone and saw a large number of users upgrading to it from older devices for good reason. It was one of the first smartphones from Tracfone with enough performance to satisfy the average user. The Ultimate 2 comes with a 4.5" touchscreen, Android 4.4, a dual core processor and 1 GB of RAM. One of the most important features this phone also includes is about 4GB of usable internal memory for applications and other storage. Many older smartphones from Tracfone have very limited amounts of internal storage. While the Ultimate 2 isn't quite as good as other mid level smartphones like the Moto G or LG G2, it is priced at a more reasonable level. In fact, you can find the LG Ultimate 2 on Amazon for just $50 last time we checked, and about the same on eBay. Don't forget to see our full Review of the LG Ultimate 2 for further details on this phone, and lots of comments from users. While the Ultimate 2 has decent specs, most newer smartphones are improved in almost every way. Next in our list, the Power (L22C) and Sunset (L33L) are very similar except for one important detail which we will cover further down. Both phones feature a 4.5" touchscreen, Android 5.0.1 and have 1 GB RAM with a quad core processor for better performance compared to older smartphones. They also have a 5MP camera, and about 4 GB usable internal memory. Take a look at our reviews for the LG Power and LG Sunset to learn more about each device, and see where you can find them for the best prices. While a good phone, the Power/Sunset have been eclipsed in performance by several newer options. These four phones were all released about the same time, and share many of the same features and specs (which is why we are including them together. Where they differ the most is in screen size. The Rebel has the smallest screen at 4.5", the Treasure has a 5" screen, the Premier comes with a 5.3" screen, and the Stylo 2 with a large, 5.7" touchscreen. Each one of these devices comes with 8 GB internal memory, a quad-core processor, 1 GB RAM and Android 5.1. See all the details about each of these devices in our reviews: LG Rebel Review, LG Treasur Review, LG Premier Review and LG Stylo 2. While these four LG phones have fairly good specs and features, they did feel somewhat cheap, and some users found various quality issues they made them less appealing. With newer options available, we might recommend continuing on in our list. This is the latest LG phone from Tracfone (at this time) and it brings some features and looks that set it above the rest of the devices in our list. The X Style has a 5" HD touchscreen, 8 GB Memory, 1.5 GB RAM and quad-core processor. It also comes with the newer, Android 6.0 operating system. The look and feel of this phone is also improved over other LG smartphones from Tracfone. It looks like a higher end device despite its low price and plastic exterior. Take a look at our full review of the LG X Style to learn more. The LG X Style takes the top spot because of small spec improvements in several areas including the newer Android OS and increased RAM compared to older devices. We hope Tracfone continues to release newer and better LG smartphones to use with their prepaid service and we will continue to update this list as appropriate. 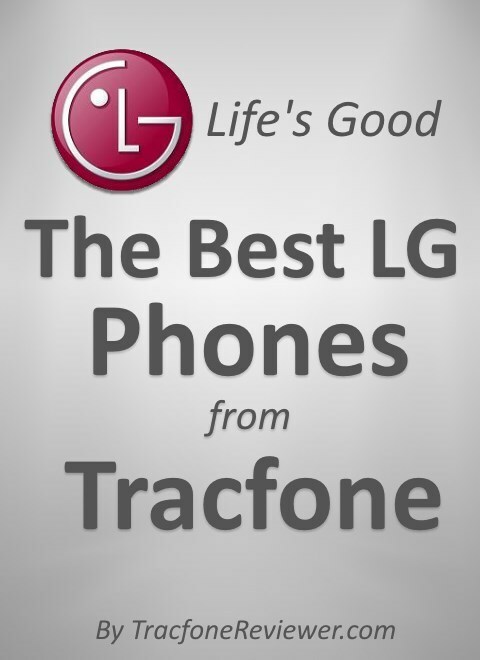 This concludes TracfoneReviewer's selection of the best LG phones offered by Tracfone. We hope you found this useful. You may be interested in reading our recent post with the Latest Deals and Sales on Tracfone Devices and Minutes. And if you're shopping for a new phone, you may want to learn about the new 'Bring Your Own Phone' to Tracfone program that we cover on our Tracfone BYOP page. This program allows you to bring a wide variety of smartphones to use with Tracfone, including some of the most advanced phones on the market like the iPhone 6 and more. Don't know what Tracfone Promo Codes are? Well, you are missing out on free minutes! The latest promotional codes form Tracfone provided to you by TracfoneReviewer. 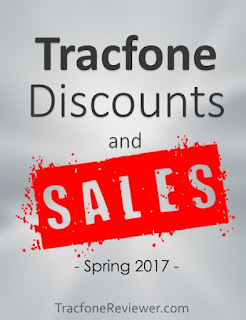 If you're new, be sure to take a look at some of the other Tracfone related information we share. 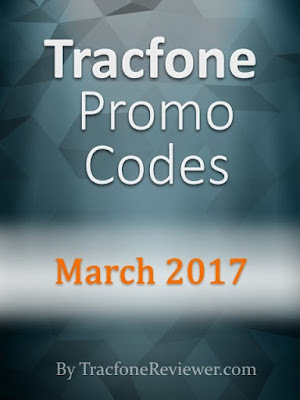 Each month we collect and share the latest Tracfone promo code for our readers to use and share. We test and check to make the best effort to provide only the codes valid for this month. Below we have the new codes for March 2017. These codes can be used to get additional Tracfone minutes for free when adding a prepaid card. Simply use a code that goes with the card you are adding, and you should receive your bonus airtime. Remember that promo codes are not supposed to work on smartphones, but they may work in some cases. Also note that certain codes can only be used once, or are for a specific geographical area. If you're buying an airtime card on the Tracfone website, you can check your code before you pay for the card, which is convenient of you want to try a few different codes. The codes below are the latest available, but we also have more options on our Tracfone Promo Code page including some that may only work in certain geographical areas or with certain offers. Read some of our latest smartphone reviews by visiting the Cell Phone Reviews page. Both the LG X Style and Samsung Galaxy Sky are recent smartphones that can be found bundled with airtime at a great deal. We also posted news about the upcoming Moto G5 smartphone which is one of the most popular devices to use with the Tracfone BYOP program. Follow the links to learn more. Promo Codes are for a certain airtime card, but can also be used with any card of greater value (except the 1 Year/400 Minute Card). These are the latest codes for March 2017. We hope these codes work for you, and let us know in the comments below if you have success, or any questions. Remember that promo codes are not supposed to work on Tracfone smartphones, but they may work so it is worth trying. Learn what the Best Deal on Tracfone Auto Refill Airtime is and also the best deal on Tracfone Airtime Cards with our helpful comparison. We share lots of news, deals and more on our Facebook page and have also recently started sharing videos on our YouTube channel. Find Tracfone Airtime and phones on eBay with lots of sale prices and airtime bundles.